Sam Brent Oscar Regal (born October 9, 1976) is a voice actor in the 2003 animated series, Fast Forward, Back to the Sewer, Turtles Forever and various Video games. He was also in the video game ObsCure. He also wrote all the cut-scenes in the Teenage Mutant Ninja Turtles: Arcade Attack game. He began as a child actor in theater in Virginia, and moved to New York City to perform in Broadway and off-Broadway shows. In 1994, he graduated from the Professional Children’s School on the Upper West Side of Manhattan, New York City. After graduating from the University of Virginia in Charlottesville, VA, he returned to New York to begin his voice acting career. He now resides in Los Angeles, CA. He is sometimes credited as Sam Regal, Sam Brent Regal, or Jack Lingo. 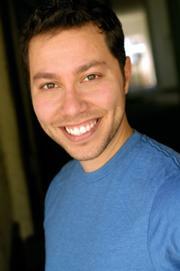 He is the older brother of Eden Riegel and the younger brother of Tatiana S. Riegel. Was a member of the college a Capella group The Academical Village People at the University of Virginia. He was in New York City on September 11, 2001, and he recorded the attacks on the World Trade Center with his video camera. Played the role of Gavroche at the Kennedy Center, and on tour to 26 cities, in musical Les Misérables. Recently Sam has played Starscream in the High Moon Studios game Transformers: War for Cybertron.